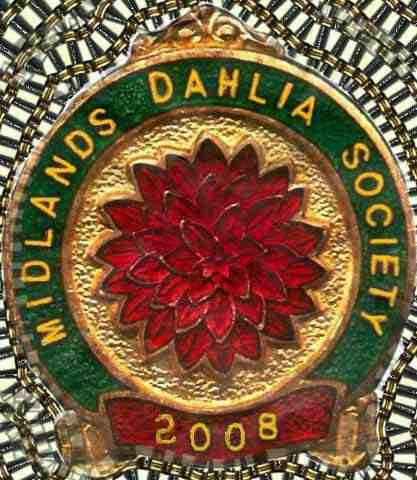 The Midlands Dahlia Society Annual Show had almost the same number of exhibitors and exhibits as last year - we used all our staging benches. Again the warm weather encouraged exhibitors from far & wide as blooms were early. The honours were shared across many exhibitors. S Burns is Midlands Champion. The Midlands Championship for the Mawby Trophy was won by S Burns from Skelmesdale, a new competitor at the Midlands. He also was successful in the Judging exam held in the afternoon. He had a wonderful entry comprising: Jomanda, Cream Moonlight, Winholme Diane and Kenora Challenger, which also was awarded a NDS Bronze Medal. His vase of Jomanda won the S&E Braddock Trophy for best vase of small ball dahlias in the show. Dave Spencer whilst second in the championship, he won the Decorative Cup for his vase of Winholme Diane and the Violet Davies Premier Award for the best vase in show with Gurtla Twilight as well as the H Dunkley trophy for the best vase of Poms in the show. Click on the photo to see the vase close up. Macrobert Walker had a good show winning a NDS Silver medal for his winning entry in the Lady Godiva Trophy class which was the best exhibit in show. as well as the Styvchale Trophy showing two vases of Kiwi Gloria - photo bottom right. Novice Classes were well supported - 6 exhibitors staged 25 vases in a range of varieties in the 6 classes. The winner of the Don Brawn trophy for the best exhibit in the Novice classes was Mark Pattenden showing Mary's Jomanda in Class 41. In the photo on the left Mark shows his vase of Rycroft Jan which won in class 40 - 3 blooms small dahlias. 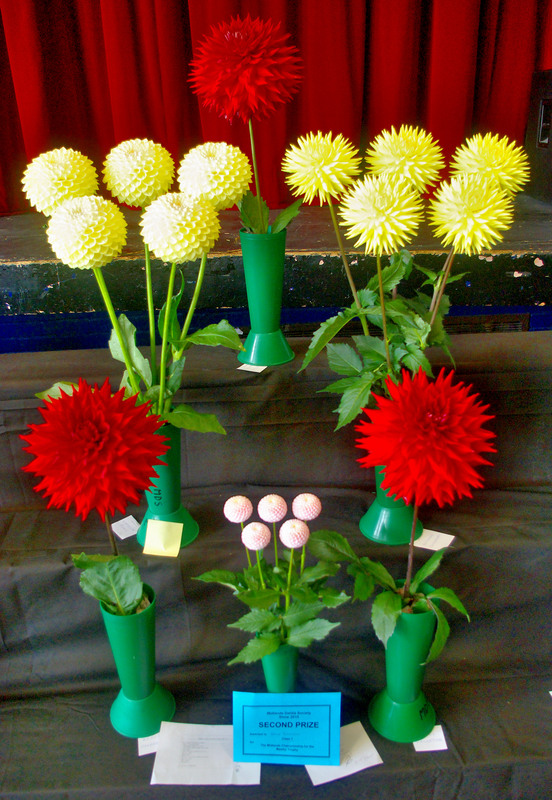 In Class 8 - for 1 bloom giant or large dahlia, Paul Bugden came 1st showing Elma E. Graham Young was 2nd and Neil Mallaby 3rd. All 3 exhibits can be seen in the photo on the right. The show would not be possible without the support of members. Above we see show manager Fred Wilson with Show ecretary Angie Guest, discussing results, ably assisted by Sarah. Thanks to our judges who did a great job. The judging teams in action top right & right. During lunch time, Midlands Society president, Ron Guest, managed to catch up with Dave Spencer, to award Dave with the Violet Davies Premier Award for best vase in show 2014. You will have to wait till the annual dinner in November to learn what this year's prize is, since Dave won it again this year! In the members classes, the 3 blooms small decs class 27 was well supported with 9 entries. Neil Gadsby won showing Rycroft Brenda T, Alan Alcock came 2nd with Gateshead Festival and 3rd was Peter Clubb. In the 3 blooms small cactus class Mark Williams won with Catherina Maria, Linda Caswell was 2nd with Rycroft Lisa and Frank Taylor 3rd with Lemon Crest. We must thank all members for assisting with setting up and closing down the show. Special thanks to Angie and team for the bacon batches & hot drinks early Sat morning as well as the team for the lunches on Sat & Sun. Exhibitors look forward to the friendly reception they get at the Midlands and it is what keeps them coming year after year, so once again thank you.